Update: As Reddit user TimSad pointed out, all the rocks in the Dusty Divot dig site have been cleared out and now the whole dang thing is filling up with lava. It's looking more and more like early speculations were dead-on: volcanic activity is about to rock Fortnite in one way or another. Last season, Fortnite players worked together to destroy an iceberg in the hopes of uncovering, I don't know, the fountain of youth maybe. What they found was a bunker, the purpose of which is still unclear. Nevertheless, players have once again taken up pickaxes to tackle a mysterious new dig site located near the desert. Yesterday, players discovered several destructible rocks in a pit at Dusty Divot, just northwest of Paradise Palms. Each rock has around 500 million health and can only be damaged with pickaxes, but like the aforementioned iceberg, damage dealt to these rocks persists across all Fortnite instances. As a result, players made relatively short work of each rock, and every rock destroyed yielded new discoveries. 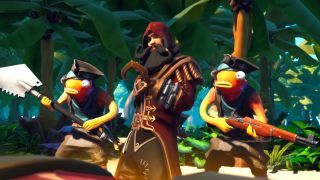 At the time of this writing, players have found some big-ol' bones, a rusty pickup truck, and most recently, a volcano vent like the ones involved in the latest Fortnite Battle Pass Challenges. It's unclear what this dig site will ultimately lead to, but considering the previous community dig kind of fizzled out, I'm willing to bet Epic has something in store. It feels like the iceberg was a trial run for this kind of universal event, and the presence of a volcano vent seems telling. Dataminers have been talking about an eruption event for several days now, and Fortnite Season 8 did add a Floor is Lava game mode. Some players reckon the volcano that appeared with Season 8 will start spewing lava which will harden and need to be destroyed, challenging players to dig once more. Whatever's coming, we'll find out soon enough. Here are all the Fortnite map changes which may soon be overridden by a volcanic eruption.